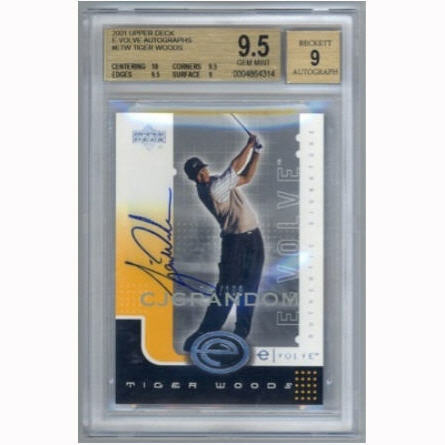 This is a true Tiger Woods 2001 Upper Deck rookie card that features an on-card autograph from the golf superstar. 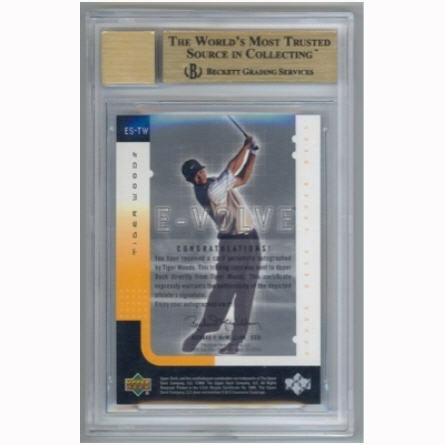 Unlike many of Tiger Woods' other rookie cards, his 2001 UD e-Volve Autographs can not be found in packs. The cards were redeemable only through Upper Deck after digitizing e-Cards that were included in packs of 2001 Upper Deck Premiere Golf. On average, one e-card redemption was seeded in each box of Upper Deck 2001 Premiere Golf. There were 6 different golfing subjects in the e-card set - David Duval, Jesper Parnevik, John Daly, Colin Montgomerie, Sergio Garcia, and, of course, Tiger Woods. Scratching off the surface of the silver horizontal bar on the front of the E-card would reveal an alphanumeric code which you could enter at Upper Deck's website. The deadline for E-card redemption has long expired years ago, so no more codes can be entered. Although the card is limited to 100 copies, its unclear if all of these redemption cards were actually submitted to Upper Deck - meaning the actual amount of these cards in circulation could be substantially less then 100.
. The seller has placed a Buy It Now price of $32,000 on the card, but is also taking bids on the card. As of the time that this article was published, bidding for the card has already reached $9,300 with 3 days and 11 hours remaining. Tiger Woods Masters 2019 Jacket Count Promo! Just Released! Limited Edition!